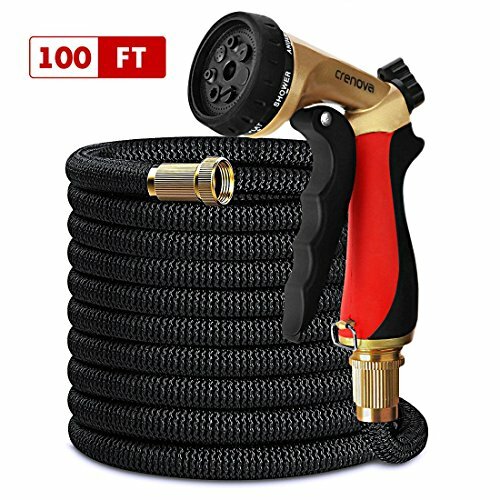 The Crenova Extendable Garden Hose with unique and innovative brass connector design guarantees the perfect connection between hose connector and spray nozzle. Thanks to new type of textile material applied, the hose can be extended up to 100ft under maximum water pressure but the dense textile keeps its shape for few years. It is easy to handle while watering and easy to coil up when it is not in use. The 7 function hose nozzle Versatile 7 Spraying Patterns, include Jet, Shower, Angle, Center, Mist, Soaker and Flat, absolutely it delivers smart solutions for all your Watering and Cleaning needs .makes you to love gardening again. Get our product today and enjoy your housework without any complaints or troubles. How to extend the life of your garden hose? 4.Do Not leave your hose outdoors in freezing winter or summer when not in use. We offer 1-year free replacement and refund policies. Moreover, our professional customer service team and technical support are on standby for 24 hours. We highly value feedback from our customer, then we remove the shut-off valve from our product to truly save your hose life. When you leave the tap open but want to block water flow by shut-off valve, it definitely will cause damages and shorten the lifespan of your hose. If you have any questions about this product by CRENOVA, contact us by completing and submitting the form below. If you are looking for a specif part number, please include it with your message.